Earlier this week, Dr. M of Deep Sea News evaluated President Obama’s science and conservation policies and awarded him a B-. I gave President Obama a C+ overall after his first 100 days in office, noting that some things haven’t had enough time to be given a fair grade, and I think things have gotten much worse since then. I was a little shocked at how high this grade was, and I left Dr. M a snarky comment (sorry, Craig). In the interest of fairness, I wanted to find a way to objectively grade these policies. The best that I can find is the Obameter, run by non-partisan fact checker Politifact. Basically, they record every promise that President Obama made during the campaign and since he’s become President, and they keep track of how each is progressing. Each is rated “promise kept”, “compromise” (something similar happened though not exactly what was promised), “in the works” (not done yet but actively being worked on), “stalled” (no work being done but it may happen at some point), and “promise broken”. The Obameter has rated slightly over 500 promises. Of these, 122 are rated “promise kept”, 23 are rated “promise broken”, and 85 are rated “stalled” as of November 17th. Rating 500 promises for a blog post seems a little much, particularly when many of the promises deal with non-sciencey things like wars and health care reform, so I searched promises by category. The categories that I deemed relevant to science and conservation are: Cancer research, cap and trade, education, energy, environment, mining, natural resources, nuclear, oil spill, science, stem cell research, technology, and wildfire. Promises that appeared under more than one subject were factored in only once. Entries within a category that weren’t really related to science (i.e. some in the “nuclear” category deal with nuclear energy and some with nuclear terrorism) were omitted. Compromise- 80%. We didn’t get everything we wanted, but at least we got something. In the works- 50% We’re not there yet, but some folks are actively working on it. You get some credit for this, but not very much. Undoubtedly some of these will turn into “promise broken”, some into “compromise”, and some into “promise kept”. Stalled- 15%. With some of the stupid crap that our government spends time on, it’s troubling that these issues not being considered a priority. Stalled basically means that no one is working on them or talking about them at all. I guess it’s nice that the promise was made in the first place, but making a promise and not following through at all is not worth a high grade in my book. Some promises are undoubtedly more important than others, just as some assignments in a class are worth more points than others. In keeping with the grading system I use for my own class, minor promises are worth 10 points and major promises are worth 50. I rated the following promises important enough to be worth 50 points: #187 invest in a smart power grid, #262 support wetlands protection and restoration, #263 improve water quality, #269 increase national park funding, #270 increase funding for water conservation, #346 appoint a science advisor, #352 encourage program to interest students in science, #353 increase research opportunities for undergrads, #393 double funding for basic science over the next ten years, #400 attract more student to science and math, #440 reduce dependence on foreign oil by investing in domestic clean energy, #439 create 5 million green jobs, #449 raise fuel economy standards, #455 work with the UN on climate change, #456 create a cap and trade system, #457 invest in the green business sector, #458 invest in all types of alternative energy, #462 make buildings more energy efficient, #467 provide job training for clean tech, #474 safe disposal of nuclear waste, and #494 share environmental technology with other countries. I rated a total of 67 promises that I deemed relevant to science and conservation. When I ran the numbers, the result was 63.7%, also known as a “D”. This is a far cry from a B -, but is also better than I was tempted to give the President without this analysis. Again, it’s probably not fair to assign any kind of grade this early in his Presidency. Several of the “in the works” promises will come to fruition, which will raise this grade. However, using the most impartial system of grading I could think of, the present grade for President Obama’s science and conservation policies is not very good. FYI- I still have the spreadsheet I used to make this calculations, so if anyone thinks that any part of my grading scheme is unfair, let me know and I can run the numbers however you want. Has President Obama broken a promise on offshore drilling? Actually, I disagree with the notion that this is too early to start analyzing. The last two years, when the president, the house, and the senate were all one party was the time to govern, we won’t see a better performance than that. We’re now left with 6 months of leading the country against a hostile house and 18 months of campaigning for the next election. Fair enough. What do you think of my grading scheme and the grade it resulted in? I thoroughly enjoyed your grading system (and have no suggestions for improving it). I wish it was possible to compare it to the terms of other presidents. 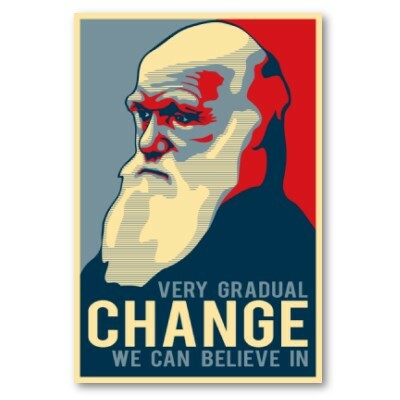 Is there a shirt with the “very gradual change we can believe in” image — I want one! Good job digging into the details, which so often get glossed over by partisans. However, I have a quibble with using academic grading standards to assess a President: an “A” is unachievable. Because of the structure of our government, Presidents are bound by constraints beyond their control, and cannot be expected to deliver on anything close to 100% of their promises. If you applied something more like baseball statistics, you’d have to say that a batting average of .637 is pretty hot, and it’s only the bottom of the fourth inning. Whatever standards you set, I’d prefer a relative assessment rather than an absolute one. How has Obama’s performance on science compared with GHW Bush’s, Clinton’s, or GW Bush’s? Unfortunately, this will inevitably devolve into qualitative assessments that go beyond scoring how many promises they kept or broke. It has also been pointed out to me that my grading scheme only measures what President Obama has actually done relative to what he promised he would do. It does not, for example, factor in that candidate-Obama made a lot of pro-science promises, while certain other recent Presidents did not. It also does not factor in positive pro-science efforts that have been made if they were not originally promised. All of this is true, but once again, this method was the best I could think of. If someone has a better idea I would really love to hear it.